Normally, this article is strictly statistics about the Florida Gators. Sure, I will post some statistics below, because I owe that to you. But today, I need to air my grievances, because I am a freelancer and am given some additional leeway that may not exist for those that cover the team every day. I like Jim McElwain and I think he can be the right guy to lead the team. 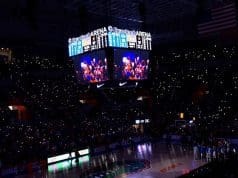 However, and you knew that was coming, as the CEO of the Florida Gators football program he is struggling and that “can” will quickly become “can’t”. I think he has done a lot of great things: he has updated facilities, he has improved social media, and he has recruited some very well balanced classes. He is well respected, has good relationships with former players and boosters, and has been able to wrangle in millions of dollars for the football program. He has steered clear of NCAA violations, has done a seemingly good job with the credit card scandal, and has otherwise has built a good program. And while all of that is true, there are a few major issues that could bring down his tenure – and that is loyalty. There is a good quote that I often use and I think it applies here, “loyalty is good, until it isn’t.” It’s not very deep or very articulate, but it has a great message – it is great to be loyal to your friends, staff, players, or whomever, but it is important to remember the answer is not always loyalty when you are running a multi-million dollar enterprise. You should be loyal to your staff, but it should not be blind loyalty. Loyalty encourages you to look past glaring issues and in isolation loyalty can be very negative for leaders and managers. 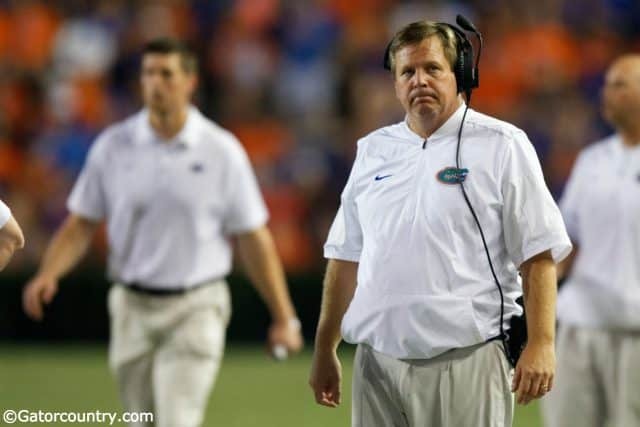 Loyalty is what is holding back Jim McElwain and could one day end his tenure at Florida. There are two areas of loyalty are currently hurting Jim McElwain. Every coach wants to be around coaches that they have a relationship with, trust, and have known for a long time. But if you look at the glaring weaknesses on staff, they start with the coaches that he has known the amongst longest: Greg Nord and Doug Nussmeier. Greg Nord, in my opinion, has two of the worst position groups under his watch – special teams and tight ends – and I have yet to see improvement in either area. His special teams ranks 104th in punt return, 79th in kick return, 111th in opponent punt return, and 129th in punt return yardage allowed – that is putrid in all facets. They look lost, they are missing blocks on gunners, and has despite one of the best punters in the country, a very mediocre punt success rate because of their inability to cover the punt. 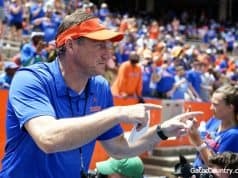 Nord, whom McElwain has known for more than two decades, has also struggled in developing tight ends with DeAndre Goolsby, Cyontai Lewis, and Moral Stephens never gaining over 550 yards in combined yardage in a season and have ultimately, struggled in blocking for the last four years. Moreover, what happened to Kemore Gamble? There are almost no positives that I can write about Nord, other than he seems like a very nice gentleman. I hate pointing fingers, but at some point when is enough enough? They have regressed on special teams for three straight seasons. They have stayed, at best, flat at the tight end position. And not once, OK one time, have I seen a recruit give Nord a major shout out for his recruiting prowess. And the problems don’t end there, because I was lead to believe that Doug Nussmeier was a quarterback guru – and I believed that because that is how it was painted when he said he wouldn’t offer a quarterback unless he threw in front of him. I have seen very little in the way of development of nearly at quarterback, other than what one would likely gain practicing more than 20 hours a week for 18 months. You know where Florida ranks in offensive categories led by quarterbacks over the last three years? Literally, there is almost no categories that you could look at from the quarterback position that rank in the top 50% of the country – in three years! The same playbook at the Gators have run with Treon Harris, they ran with Austin Appleby, and with Feleipe Franks – and everyone in between. I have yet to see adjustments for strengths, while I have watch five different quarterbacks struggle with tempo, finding open receivers, and making reads. They are slow on offense with no tempo, despite continuous saying “we’ll get around to it”. I blame that on coaching. It should not take on average 29 seconds to get each play snapped. If it does, your play calling is too complex. Figure it out. 109 teams can snap the ball quicker and nearly every single one is ranked higher on offense. If the playbook is too complex, change it. If the players are not built for your playbook, change it or recruit better. Stand passes work. I don’t see them. Wheel routes always work. I rarely see them. Tosses to the short side of the field never work. Stop running them. If Feleipe Franks has trouble making reads, run the damn ball more. If you are shredding a team on the ground in the first half, don’t call three straight passes to start a half. And I am just casting aspersions on Doug Nussmeier, I know that Jim McElwain’s offense is being run through him and that McElwain knows the calls being made. 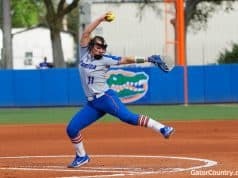 I track 31 offensive categories: the Gators rank below 100 in 12. The Gators have averaged more than five yards per carry per game this season four times – they haven’t done that in a season since 2012. Malik Davis is averaging 99.6 yards per game over the last four games. The Gators still have a 100% conversion rate in the red zone and rank 29th in the country in points per trip inside the 40-yard line (4.92). The Gators make it past the line of scrimmage on rushes 84.7% of the time, which ranks 19th in the country. The Gators rank 116th in the country in sacks allowed on expected passing downs. Because almost no matter what the situation is on second down, Florida likes rushing the football – that is why they are ranked as the 111th ranked 2nd down offense. The Gators rank 7th in the country in completion percentage allowed. They rank 18th in third down defense, and for the 27th straight SEC regular season game, the Gators held an opponent to less than 50% on third down. Marco Wilson has allowed the fewest receptions against him of any SEC cornerback. Texas A&M was averaging 36.5 points per game and Florida only allowed 19. Florida held Texas A&M to the fewest yards they have had since their second to last game of 2015.